Fiat G.50 bis, MM. 6050, of 162a Squadriglia, 161° Gruppo Autonomo C.T., Rhodes-Gadurra, January 1942. Three-tone scheme with Green and Brown blotches on Sand background and Light Grey undersurfaces. Black national insignia carried on clear roundels in four wing positions with red propeller. This Fiat-built fifth series machine was of a new version called ‘bis’, characterised by a different rudder and a longer tail cone, while the tail-wheel unit was moved forward. Even the cowling had been slightly modified around the exhaust area, while reinforced oleo legs had been adopted involving minor wheel cover modification. Fiat-built machines could be identified by their distinctive tail cross design, covering only the rudder surfaces, as opposed to the wider and longer CMASA type. In December 1941 161° Gruppo, based at Rhodes since early in the war, started receiving G.50s to supplement the CR.42s previously in force. Fiat G.50 bis of 162a Squadriglia, 161° Gruppo Autonomo C.T., Boccadifalco, January 1943. Green lizard camouflage with Light Hazelnut Brown blotches on Dark Olive Green base and Light Blue-Grey lower surfaces. Wing national insignia on clear roundels and blue-grey spinner probably. Note the small ‘yellow five’ on tail fin, possibly inherited from a previous code. Also worth of note was the unit code, of the distinctive design used by this unit, placed slightly misaligned with the fuselage centre line, a probable sign of an hurried painting. The tall radio mast, typical of late production machines, denoted a more powerful wireless set. After having operated for a long period in the Aegean theatre with mixed CR.42 and G.50 equipment, this group had been transferred to Southern Italy to carry aerial defence missions of naval traffic, following intensification of enemy raids in 1942. Palermo-Boccadifalco Airport, also known as Emanuele Notarbartolo Airport, is the elder of two facilities which serve the Sicilian capital Palermo, in Italy. 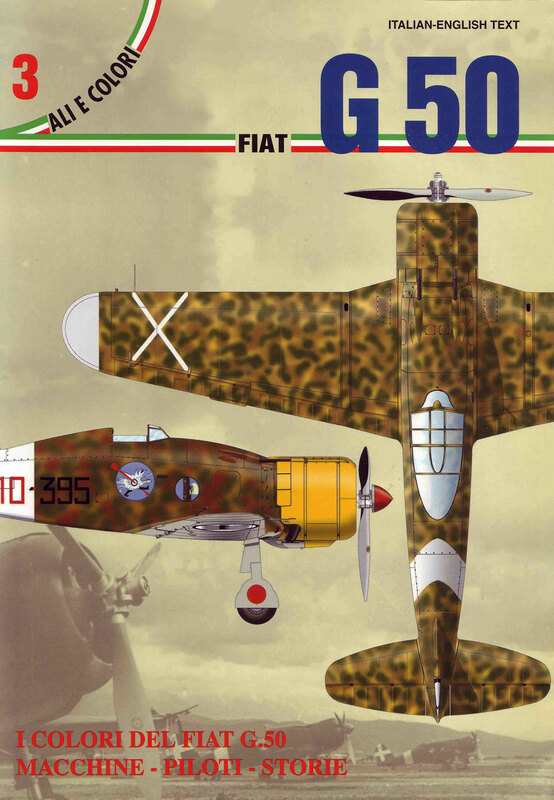 Fiat G.50 bis, MM.5943, of 163a Squadriglia, 161° Gruppo Autonomo C.T., Grottaglie, February 1943. Overall Dark Olive Green camouflage with Light Blue-Grey under sides and wing national insignia on clear roundels. The aircraft paintwork shows many traces of field retouching , particularly in the tail area forward of the tailplane, where serial numbers were seemingly hastily hand painted in white letters. The distinctive codes of this unit were retained, even if the individual number is now carried on fin. Early In 1943 this group, now mainly equipped with Macchi C. 200s, had 1-62a Squadriglia based at Crotone, 163a Squadriglia at Grottaglie and 164a Squadriglia at Reggio Calabria, intensively operating and escorting convoys to and from Tunisia. Taranto-Grottaglie "Marcello Arlotta" Airport is an airport serving Taranto and Grottaglie, both comunes in the province of Taranto in Italy. The airport is located 1.5 km from the city of Monteiasi, 4 km from Grottaglie and 16 km from Taranto.